Editor's Note: Quail Bell first ran a story about the Richmond Vampire in 2011. Check it out here. After I had heard about the Church Hill Tunnel's famous collapse, I did countless hours of research. I looked into the first accounts of the people that were interviewed at the time. There are so many stories of the horrors that they saw and there are a lot of people who had asked me if I had heard of the Richmond Vampire when I first moved to Virginia from Atlanta. Of course, being that I have only been here close to six months, I hadn’t. Then I began to learn more about this so-called Richmond Vampire. Here's a refresher if you didn't read my story this past weekend: The Church Hill Tunnel collapsed on October 2, 1925. It collapsed on a locomotive and quite a few people were killed and buried under the wreckage and rubble. Amidst all of the wreckage, onlookers say that they saw a man escape the collapsing tunnel. His muscular body was covered in blood and it looked as if his skin was peeling off of his body. He had burns all over him and his teeth looked like bloody fangs. 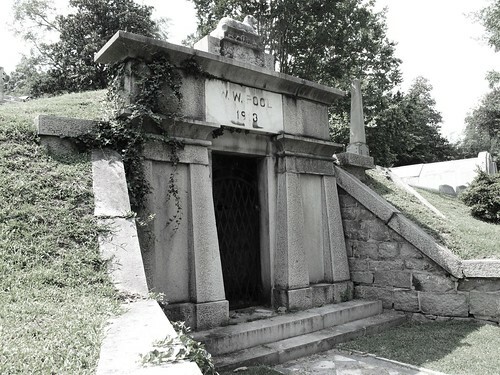 Soon after he escaped the tunnel, onlookers say they saw the "vampire" run into the Hollywood Cemetery and hide in the mausoleum of one W.W. Poole, and that is where he rested or died. The true story of this man is that he was a locomotive fireman named Benjamin Mosby. He was a sturdily built 28-year-old who had been helping to shovel coal into the locomotive. When the tunnel collapsed, he ran out of the wreckage, very burned and scarred. His teeth had been knocked out and chipped from the collapse, making them fang-shaped. Mosby ended up getting to Grace Hospital and died there. The legend of Mosby going into Hollywood Cemetery is a bit far-fetched because of 1) the distance between the tunnel and the cemetery, and 2) just how massive his injuries were. I suppose that the onlookers made up this urban legend to have a ghost story of their own to tell later on. Since those days, there have been mentions of noises and orbs around the grave site of W.W. Poole, but no one for sure knows if it is the spirit of this so-called Richmond Vampire or another spirit trying to tell us something. All that we can figure out is that this is a pretty creepy ghost story to tell the small children in your life around Halloween. It will either make them want to go explore Hollywood Cemetery or keep them out! Check out Quail Bell's documentary about the cemeteries of Richmond, Virginia at RVADeadBuried.com.